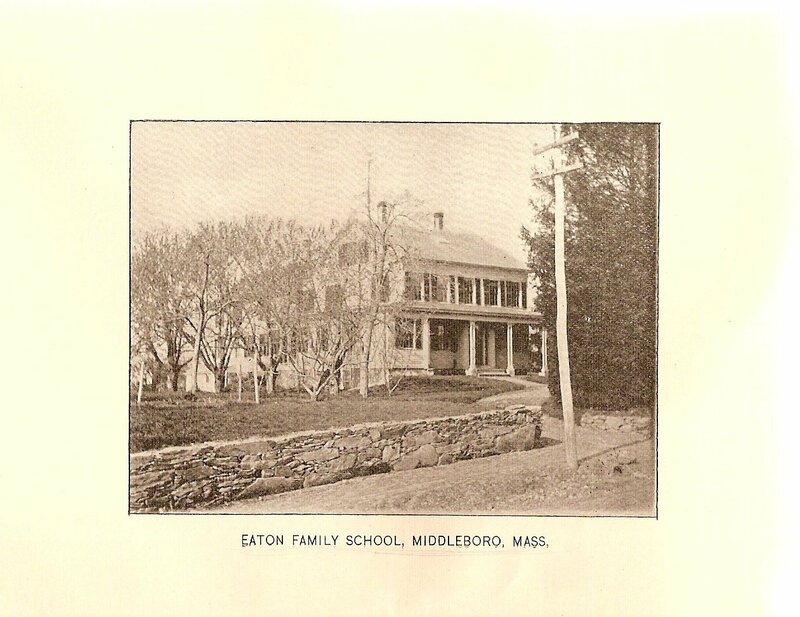 As the successor to both the Middeboro' Boy's School, the Eaton Family School which operated between 1874 and 1898 in Middleborough continued to provide the same fundamental family-style education first developed by Reverend Marston some twenty years earlier. However, under the proprietorship of Reverend Herrick M. Eaton of Westerly, Rhode Island, and particularly his son, Amos H. Eaton, of Middleborough, the Eaton Family School would achieve an even higher reputation among New England academic institutions and earn a place in the educational history of the community. Amos H. Eaton was born July 2, 1843, at Camden, Maine, the son of Reverend Herrick M. and Joanna (Hopkins) Eaton. He was educated in Camden public schools, the Maine Wesleyan Academy, the Eaton Family School at Kent’s Hill and finally Gould Academy. Following this, Eaton, at the age of sixteen, began teaching at Titcomb Academy in Belgrade, Maine, and two years later, in 1861, he assumed charge of the Eaton Family School at Kent’s Hill for a period of two years. 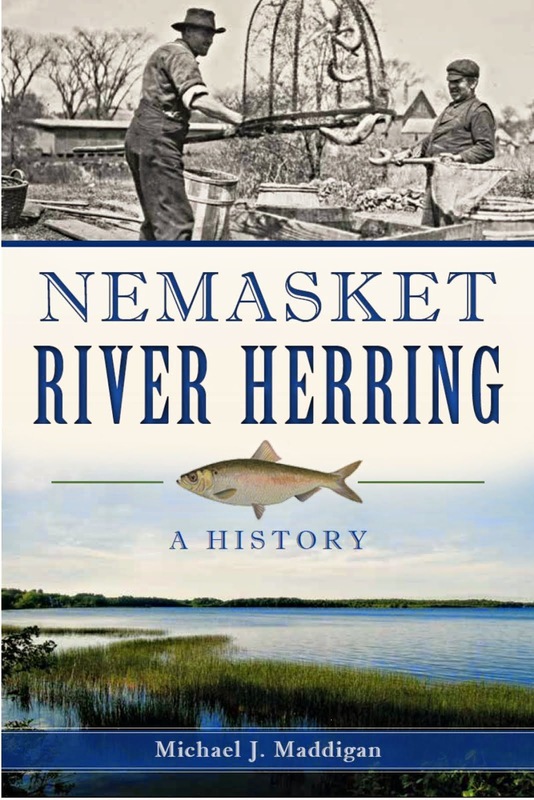 After a stint as a traveling salesman, Eaton founded the Eaton Family and Day School at Norridgewock, Maine, with his older brother Hamlin F. Eaton. Later, he served as Superintendent of Schools for Somerset County, Maine, and had charge of Hartland Academy in Maine, as well, before coming to Middleborough. 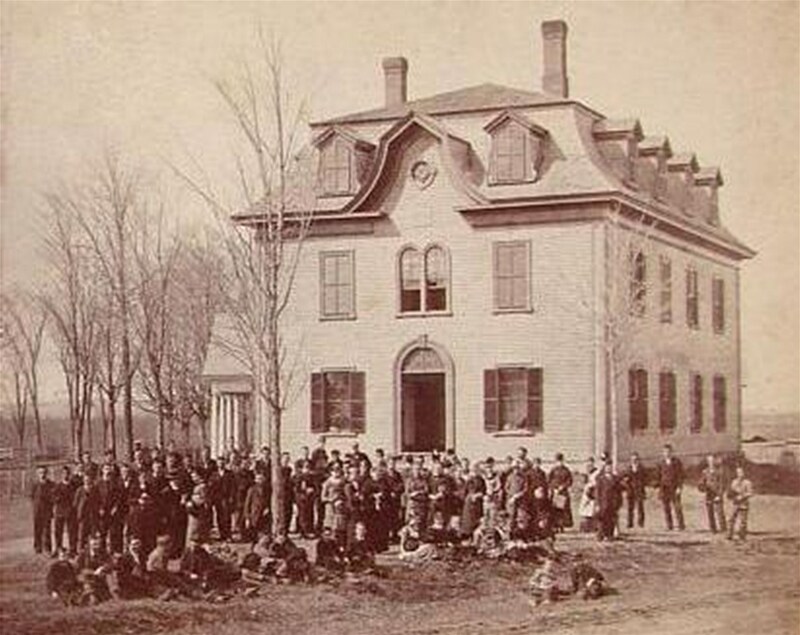 The acquisition of Cushing’s School in Middleborough in 1874 marked Eaton’s return to the management of a family-style educational institution. The prospectus of the Eaton Family School outlined the school’s purpose, emphasizing that “the small number of pupils enables the members of the school to be treated as members of the family, so that good manners as well as good morals can be inculcated…. No student whose influence is injurious to the others will be allowed to remain in the family.” (Asterisks beside pupils’ names in the school’s catalog indicated students who had been dismissed for such misconduct). Students like Edward E. Litchfield of North Scituate (now Norwell) who was expelled for misconduct sometime during the 1881-82 academic year were required to endure the humiliation of seeing their expulsion recorded in the school's annual catalog, a shame that nonetheless undoubtedly reassured the parents of better behaved children. The school's kindergarten, one of the first established locally, marked the school as a progressive institution. Opening on September 6, 1878, under the direction of Marquita Putnam Eddy, the daughter of William C. Eddy of East Middleborough, the kindergarten had an enrollment of 16 pupils all drawn from Middleborough and included Eaton's own two daughters, Bessie and Emmie. At the Eaton Family School there was no prescribed curriculum, although a large emphasis was placed upon preparation for college through the so-called "Classical" curriculum. Reading, spelling, penmanship, free-hand and mechanical drawing, rhetoric and oratory were all required. Declamations and Compositions were required twice monthly and students were also called upon to write home each month. In what today would be considered a gross invasion of privacy, these letters were both read and corrected by the teacher. The social and physical sciences and the humanities were well represented with coursework in geography; world, American and U. S. Constitutional history; chemistry; physiology; astronomy; botany and philosophy. Latin, French and Spanish were offered to those students who expressed and interest. Vocal and piano instruction was also provided should students so desire. In addition to the Classical curriculum, the school offered more practical classes, including mathematics and book-keeping, both of which were described in 1879 as "specialties". Additionally, vocational courses were taught including navigation and land surveying (taught through field practice). The object was to provide a well-rounded education for students intent upon seeking a career in business, not just the professions to which private academies generally catered. "It is intended to make the instruction in this department as thorough and valuable as it is in any Commercial College", boldly stated the school's catalog. 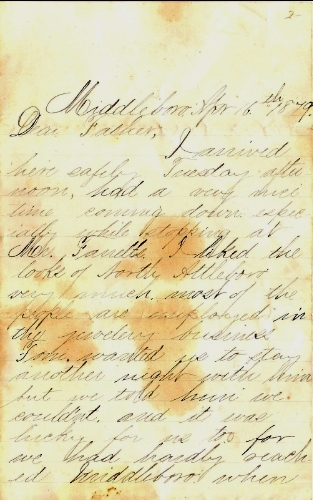 Eaton's firm belief in the practicality of education is demonstrated in a letter dated April 16, 1879, written by 17-year-old Albert Jarvis Hastings of Medway to his father Demming. In the letter, Hastings remarks on the advice given him by Eaton regarding his education. "I think I hall take up Latin and Chemistry", Hastings wrote. "I asked Mr. E about taking Algebra and he thought it would not be much of a benefit to me unless I went through it and took up some of the higher branches." Hastings appears to have heeded Eaton's advice. "I have Reading and Spelling so I think I have about all I can attend to" without Algebra. Eaton recognized the value of play and encouraged recreation for the children. "Ample provision is made for recreation and innocent amusements, and great pains are taken to make the pupils contented and happy." Teachers frequently joined in the games with their pupils. Physical activity was encouraged as evidenced by one report that remains from 1878 of a child who broke a wrist after a short fall from a horizontal bar. The fracture was set by Dr. Hodgson of Middleborough. Given the large number of students and the close contact they experienced, maintaining their health was a constant priority for the Eatons. In late 1878 scarlatina, otherwise known as scarlet fever, appeared in the school, afflicting Eaton himself. The cases fortunately proved mild and by the close of the year the patients had all recovered. Eaton was assisted in his educational work by a number of women over the years including Misses Lillia E. Thurston and Ella B. Stevens in 1876, Miss Hannah Connor in 1877, Miss Hattie S. Morgridge in 1878 and Miss Marquita Pratt Eddy in 1879. Eaton’s wife, Alice, served as matron as well as the apparent record keeper and treasurer of the school. It is her signature which is inscribed in the front of one of the school’s four remaining record books. Later teachers included Miss Nellie P. Nichols (elocution and physical culture), Miss M. A. Overhiser (piano) and Mrs. Dora P. Leonard (vocal). “Reading, spelling, penmanship, vocal music, drawing and recitations will be expected to participate in, the first three being daily exercises." Though the Eaton Family School was most frequently considered a boarding school, the majority of pupils were actually day students from Middleborough, and the number of students accepted as boarders or "family members" was purposely limited in order to maintain the home-like atmosphere that was the rationale for the school. For those who did board, strict rules were established, each student being required to “furnish their own towels and other articles for their personal toilet. Each one should be provided with a Bible, a dictionary, a slate, and umbrella and rubbers” or rubber boots - the last two concessions to the generally miserable spring weather. Required texts were furnished at “regular prices.” Purchases of necessary items were diligently recorded by Alice Eaton in the school ledgers. The 1882 catalog was explicit that clothing should be marked by parents, declaring in no uncertain terms that "unmarked clothing will not be laundered". Students boarding with the Eatons, as well as the day students, were expected to attend church services at least once on Sundays. Regional poet James Riley who attended the school, later in 1888 described the school's setting in poetic phrases: "Surrounded, as is the Eaton School, with all that is beautiful in nature before it and stretching away the green fields to meet the blending roof-tops, where spire and turret lift themselves to heaven, with the river sparkling in the valley, and the distant pines, where climbs the sun at morn, all make those quiet sades, indeed, a picture of contentment." The school catalog was more prosaic, indicating that the school was near enough the village "to enjoy all the advantages, while at a sufficient distance to be free from noise and disturbances." As had been the case with both the Marston and Cushing Schools, gardening and horticulture were actively encouraged and part of the academic program. 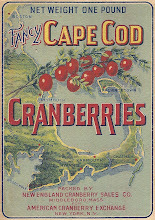 The Eaton School record books indicate that the large pear orchard and grape arbors that had produced quantities of pears and grapes during Perez Cushing's time continued to be cultivated by the Eatons. Nature studies and botany complemented each student's education. Students at the Eaton Family School were drawn primarily from New England and New York, but some came from as far away as Virginia and New Brunswick. In advertising his school, Eaton linked it to both Cushing’s and Marston’s schools, indicating in 1879 that the school had been established “a quarter of a century ago”. 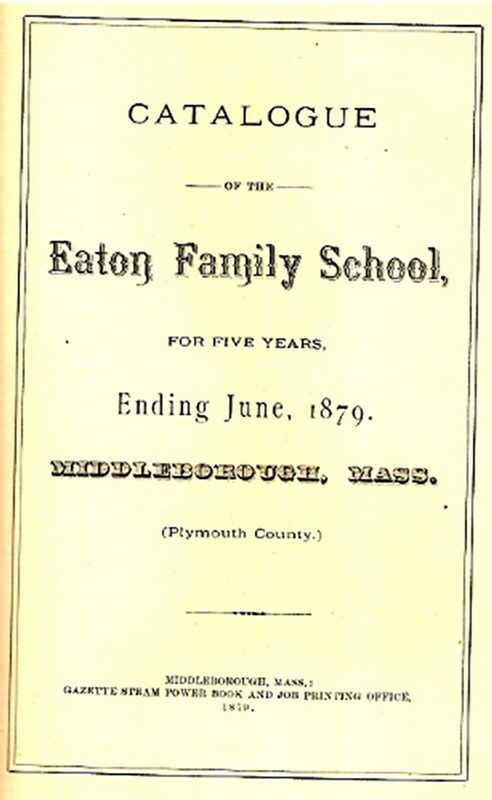 Nonetheless, Eaton also emphasized that under his direction, the institution had “constantly increased in the number of its pupils and improved in the efficiency of its instruction.” Unlike Marston’s early school, however, the Eaton Family School did draw from the local community, with Middleborough students attending as day pupils. Eventually, attendance at the school was limited to 10 boarding pupils and 30 day pupils. While the so-called “family pupils” who boarded with the Eatons paid $300 a year for their education, local day pupils paid only $40, a considerable bargain. 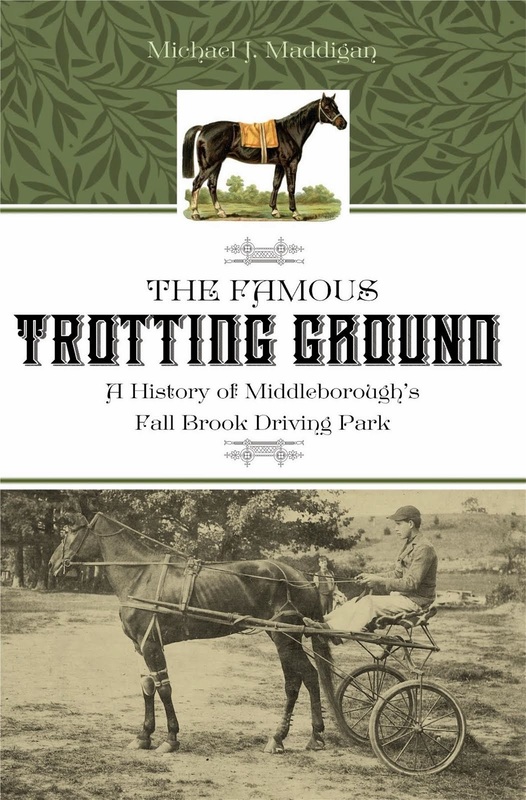 The Middleborough students who attended the Eaton Family School were the children of the town’s professional and commercial elite and among those local students attending during the school’s earliest years were William H. Andrews, son of shoe manufacturer William Andrews; Charles H. Briggs, son of Middleborough’s most successful liveryman Otis Briggs; Edward Brayton, son of Star Mill treasurer George Brayton; Estelle B. Coombs, daughter of Middleboro Gazette publisher and editor James M. Coombs; Goerge A. Cox, ward of attorney Everett Robinson; James, Stephen and Carleton, the sons of Captain Stephen B. Gibbs; Ivory H. Harlow, Jr., son of lumber mill owner and box manufacturer Ivory Harlow; Fred H. Jenney, son of coal dealer James L. Jenney; Bertie E. Kingman, son of shoe manufacturer C. D. Kingman; Alice D. Ryder, daughter of Old Colony Railroad architect Earl E. Ryder; Serena A. Shaw, daughter of druggist William B. Shaw; and Clarence E. Tobey, son of Star Mill superintendent Charles Tobey. 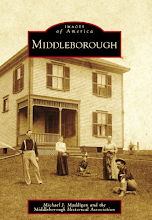 Interestingly, Charles E. Wilbar of Middleborough is also recorded as having attended the school. 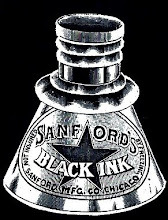 His patron was listed in the school’s earliest catalog as Mrs. C. S. Stratton, better known to us as Mrs. Tom Thumb. In the first five years of the Eaton School’s operation, although annual enrollment was restricted to 15 pupils, some 86 students attended. Enrollment, particularly of day students, increased steadily during the proprietorship of the Eatons, so much so that by the 1895-96 academic year the school was obliged to hire space in what is now the Glidden Block on Center Street, where space was provided for a school and recitation rooms for sixty pupils. The School continued to emphasis both general and vocational education, and prided itself on the business course of study which it offered students. The catalog for the 1895-96 academic year noted “the large number of young men and women occupying good business positions, who received their instruction in this school.” During the 1895-96 academic year, and evening school was offered which proved successful enough to warrant its continuance the following year. 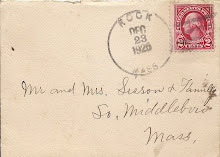 Many of the school’s graduates maintained fond recollections of their educational experience in Middleborough, and a number of them eventually established the Eaton Family School Association, which began holding annual reunions in 1885. These events included a mid-day dinner served on the school lawn (or in the classroom in the advent of inclement weather) which was catered by Middleborough baker Samuel S. Bourne, with occasional literary exercises being held in the Y. M. C. A. rooms on Center Street. 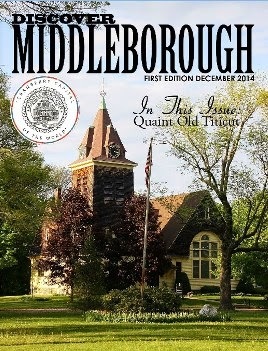 Each reunion culminated with a promenade, reception and dance, held in later years in Middleborough Town Hall. The Eaton Family School continued to operate until 1898 when Amos Eaton was elected to the combined position of Middleborough Town Clerk, Treasurer and Collector, a position which he held until 1909. 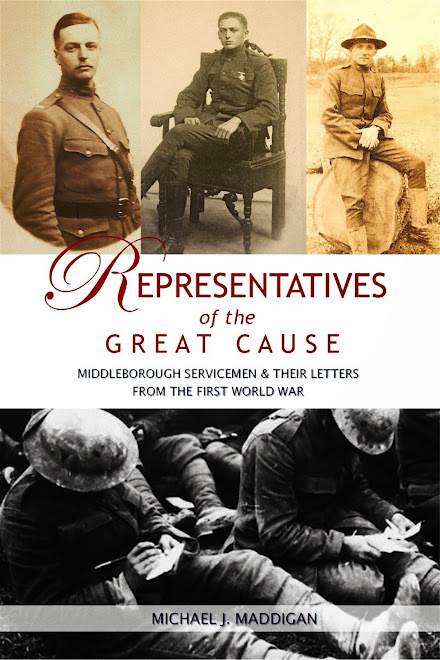 Throughout the years, however, Eaton continued to maintain contact with his numerous former pupils, preserving a variety of items sent to him including wedding invitations, letters, birth notices and death notices. 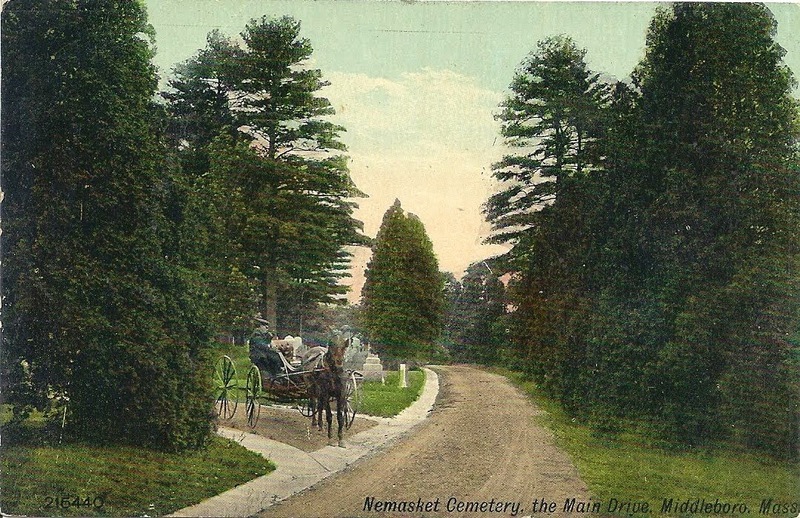 He died March 31, 1910, at the Homeopathic Hospital at Boston, “one of the most beloved and respected men of his time.” He left behind him an educational legacy of nearly a quarter-century and the fond memories of several hundred boys and girls. At the time of his death it was written of Eaton: "He was an ideal teacher, a great lover of books, a fine scholar himself, broadly sympathetic in the hopes and ambitions of his pupils he won their affection to a degree rarely enjoyed by a teacher." 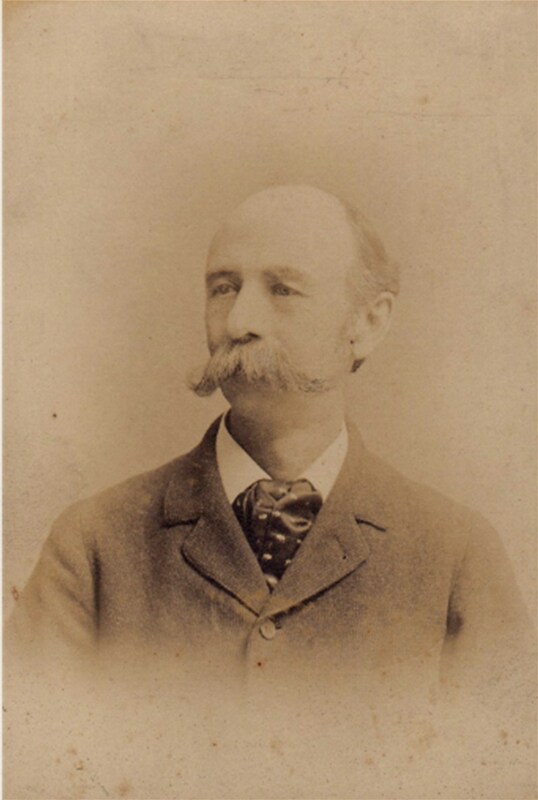 Amos H. Eaton (1843-1910), photograph, late 19th century. Eaton was the founder of the Eaton Family School on East Grove Street. A progressive teacher and principal, Eaton won the affection of his numerous pupils and was noted as one of the community's best loved and most respected educators. Eaton Family & Day School, Norridgewock, ME, photograph, mid-19th century. 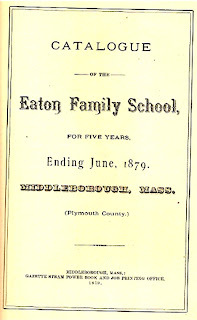 Catalogue of the Eaton Family School, for Five Years, Ending June, 1879. Middleborough, Mass. (Plymouth County.) 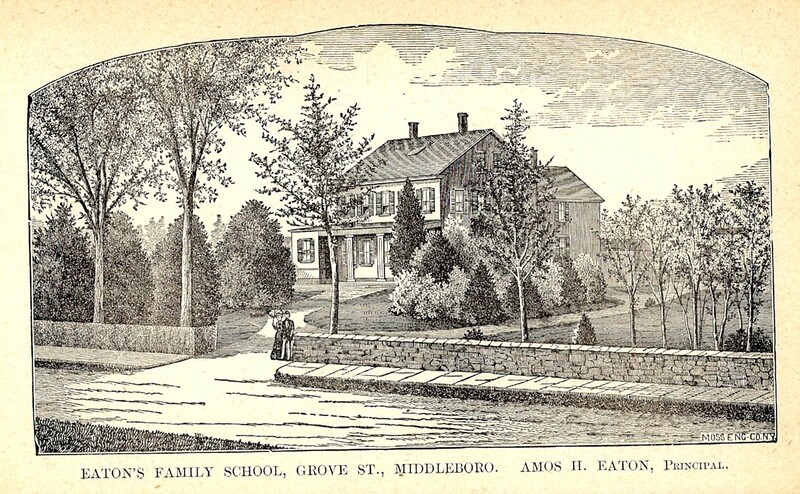 Middleborough, MA: Eaton Family School, 1879. This catalogue printed by the Gazette Steam Power Book and Job Printing Office of Middleborough was one of many printed for the school. "No Prescribed Course of Study" notice from undated Eaton Family School Catalogue, ate 19th century. 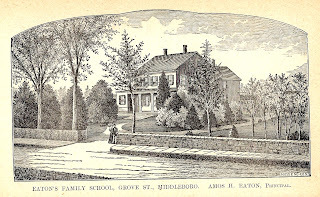 Eaton Family School, engraving, c. 1870. 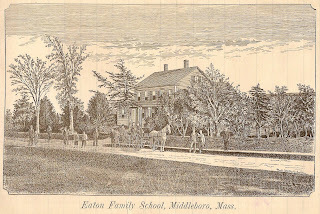 This engraving, originally produced for the Middleboro' Boys' School, was later used by the Eaton Family School in its promotional literature. Letter, Albert Jarvis Hastings to his father Demming Hastings of Medway, MA, April 16, 1879. 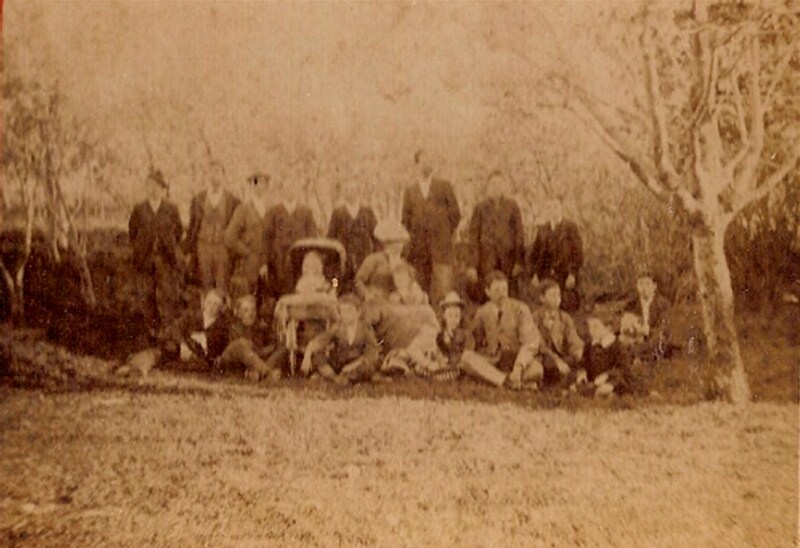 Eaton Family School group, stereocard, 1870s. 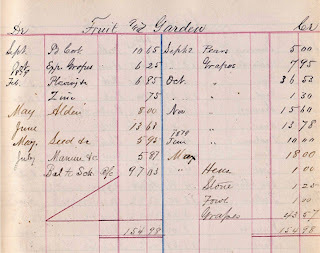 Eaton Family School ledger, late 19th century. 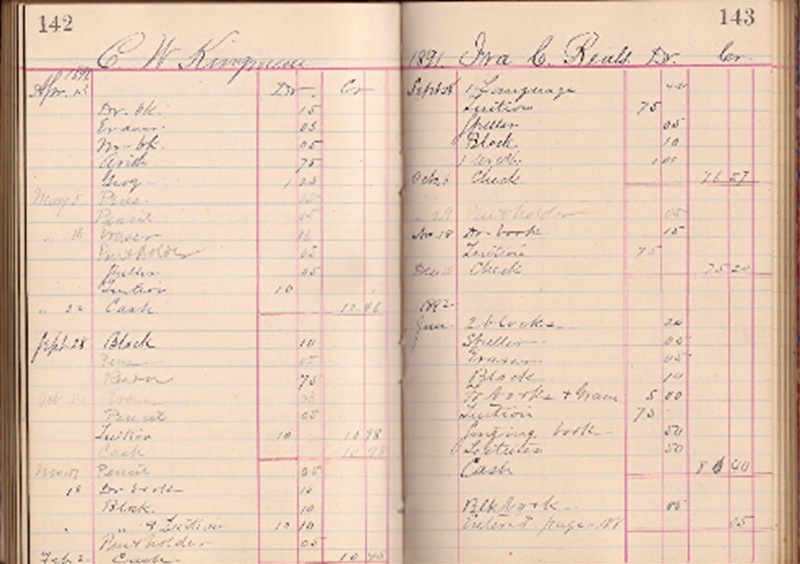 The ledger shows the accounts of Charles W. Kingman of Middleborough and Ira C. Beals with expenses for pens, pencils, blocks, erasers and texts. Eaton Family School, engraving, c. 1879. 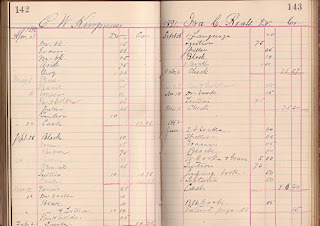 Eaton Family School ledger, 1879. 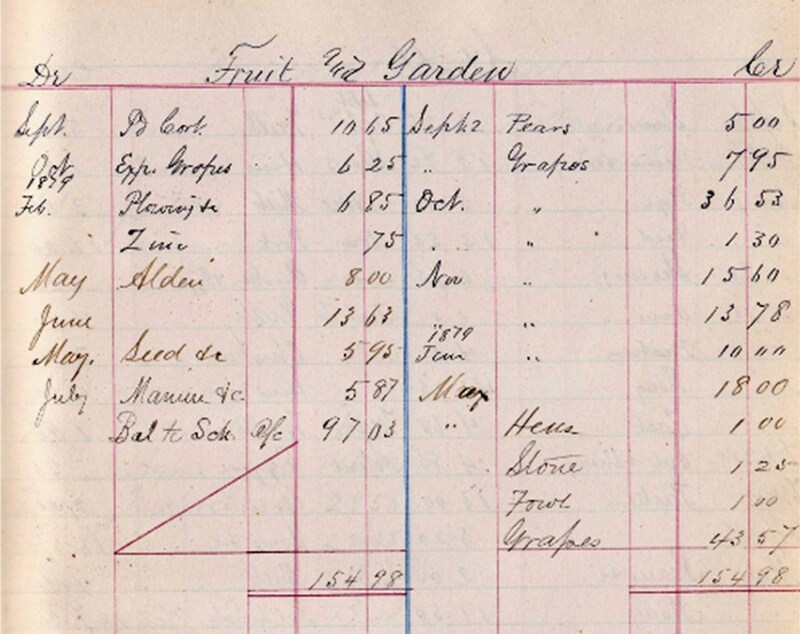 Accounts for the fruit orchard and gardens maintained by the school were kept separate from those of the school's educational expenses. 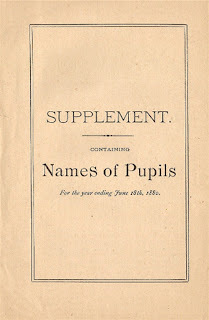 Supplement Containing Names of Pupils for the Year Ending June 18th, 1880. 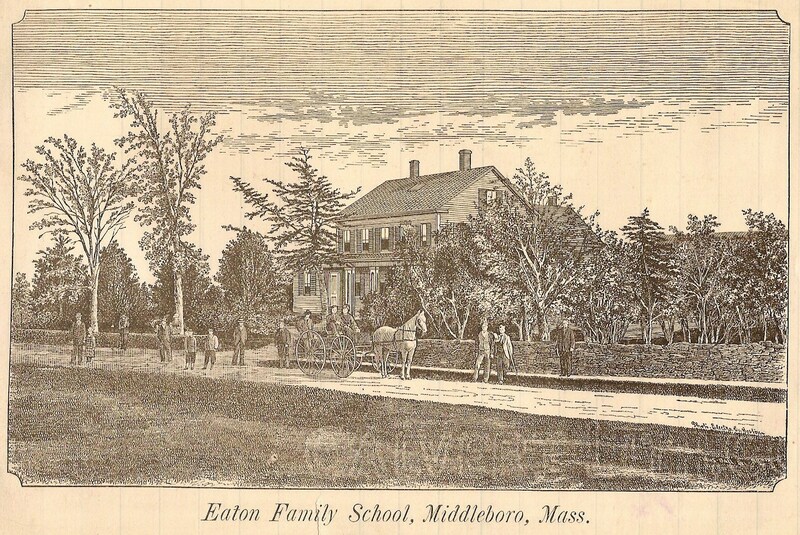 Middleborough, MA: Eaton Family School, 1880. Eaton Family School, photographic half-tone, c. 1890. 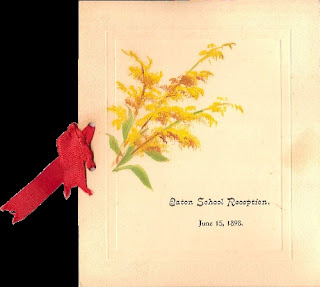 Eaton School Association reunion dance card, 1898. 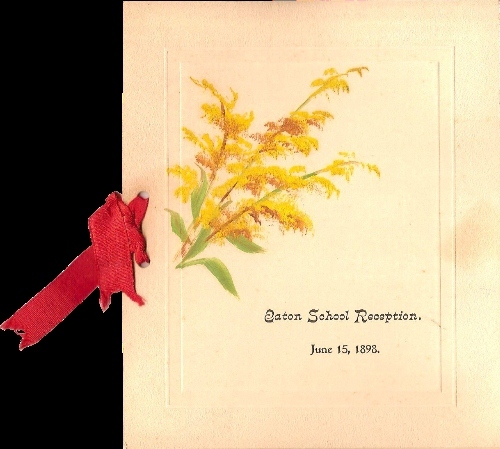 The 1898 reunion featured hand-painted floral dance cards including the one pictured here. Eaton Family School, photograph, early 20th century. 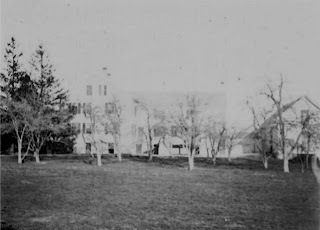 Few photographs exist of the Eaton Family School taken during its operation as an educational institution or in the period immediately following. 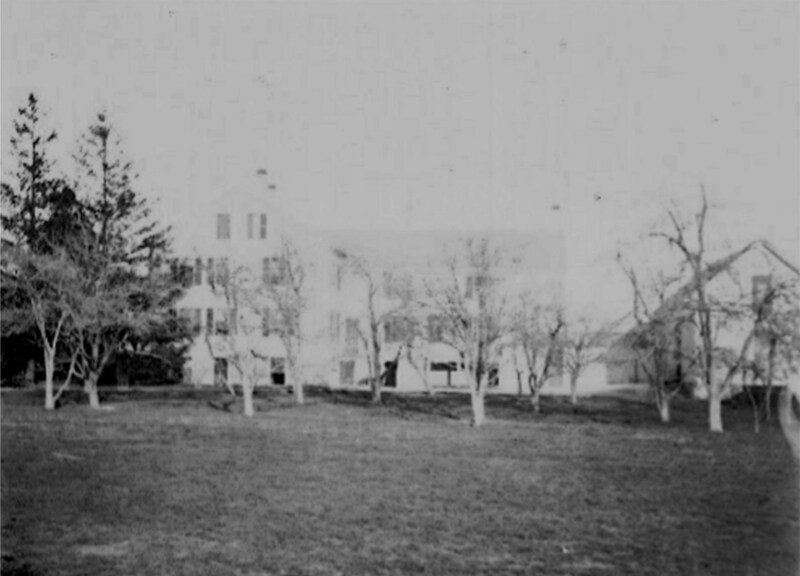 This view taken from the west depicts the school as well as a portion of the pear orchard planted to Perez Cushing, proprietor of the Middleboro' Boys' School.